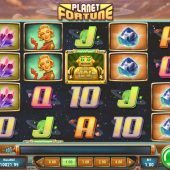 Planet Fortune slot joins the catalogue of futuristic cartoon-themed games that Play'n Go have released to date, such as Moon Princess and Cloud Quest only this time we have spins rather than cascading symbols. Our reels sit over a space world being buzzed by various flying objects and we spin to 1950's cosmic sound effects straight from the old films of that era to bring us into a slotting 'Twilight Zone' to complete the effect which works quite well it must be said! So will an excursion to this other world mean you find Planet Fortune or Planet Bust? We have a grid of 5 reels of 4 rows each which offer us 40 paying lines but you can play for as little as 20 coins if you choose to. The icons are single except for the four premium picture icons which award 18.5x bet for the Astronaut, 12.5x for the Lady, 7.5x for the Crystals and 5x for the Blue Gem for 5-of-a-kinds. There are single Wild Robots which have a useful role as we'll discover shortly but should you see a full line they'll pay you 62.5x bet. The remaining ones are five card values from 2.5x down to 1.25x and there are no scatters, but don't worry - you do get a decent feature or two in this galaxy! Randomly the reels can join and spin together in Twin Spin fashion but only 2 or 3 will become magnetic and when they do they will be populated by either 2x2 or 3x3 block Colossal Symbols respectively. This may or may not guarantee a win, depending on which reel do this. Remember those Robot Wilds? Well they form the scatter in Planet Fortune and 3 in view anywhere triggers 10 free games with those triggering Wilds held in place. You cannot retrigger them or get extra spins but these Wilds transfer one position to the left each spin and and further ones landing also stick in place and do the same, plus they appear more frequently in the bonus spins. You can get a full screen which offers the game's maximum pay of 2500x your stake.